The animal university hospital in Uppsala has one of Europe’s largest veterinary image diagnostic centres. Here, they work with small and large animals, providing image diagnostics and treatment. In 2014, they switched to Ergonomic Lighting in order to improve the working environment – and the results are good. Horses, dogs, cats and cows are just some of the animals that are examined on a daily basis, for example with ultrasound, at the animal university hospital in Uppsala. The university hospital has one of Europe’s large image diagnostics clinics and sees all kinds of animals with many different diseases. The centre is state-of-the-art and works together with scientists, students, veterinary nurses and veterinarians from all over the world using the latest knowledge. In 2014, the animal university hospital moved to new premises, and as part of the new construction, working environment became a main priority. Therefore, the chief veterinarian and manager of the clinic, Margareta Uhlhorn, chose to install Ergonomic Lighting from Chromaviso. ”We are faced with challenges regarding the working environment in this place. The staff is tired because of the darkness – particularly during winter. In order to ensure a good image on the monitor, lighting is important. We used to work in darkness, but then we heard about Ergonomic Lighting. Now, we get more light during our workday and a good image on the monitor”, explains Margareta Uhlhorn. The animal university hospital has a large room for ultrasound examinations of large animals, such as horses, two ordinary rooms for scanning of smaller animals as well as a large description room with eight description stations, where the staff looks at images and writes reports. ”The light in our rooms is very flexible and can be adapted depending on where we place the monitor. 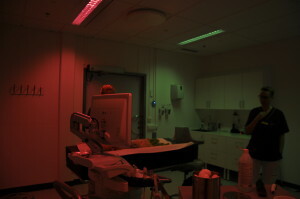 With the large animals, we often move around the ultrasound equipment, and in that connection, the light goes with it. It works well”, says Margareta Uhlhorn. The light has been customised for ultrasound scanning, and the staff can choose between several light settings, which means that they get the right light before, during and after the examination. When the animal comes into the room, the staff often chooses a bright white light. 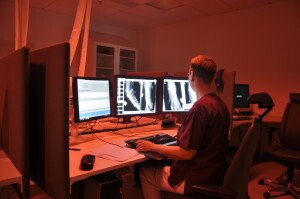 When the scan is started, the staff chooses a red light behind the monitor, combined with a more green light in the rest of the room. The red colour makes the grey tones of the ultrasound image look sharper, while the combination with the green light provides a pleasant working environment that reduces glare and reflection. After the procedure, the light is easily changed to a strong light for cleaning, which simulates daylight and provides an energy boost. But how do the animals feel about the coloured light? ”The animals are awake during the scans, and they have not reacted to the coloured light. Horses can become worried when it is dark – which means that it is an advantage that the room has become brighter. Maybe the horses can sense how the staff feels – and we feel better”, says Margareta Uhlhorn. On a typical workday, most of the staff spends up to eight hours in rooms where there used to be darkness, but which are now equipped with Ergonomic Lighting. In the description room with eight work stations, the red light is used to optimise the image quality while giving the staff the light that they need to thrive. ”The employees have more energy and we are less tired. Ergonomic Lighting has had a great effect on our working environment”, explains Margareta Uhlhorn. In order to ensure that the light is optimal for the work at the animal university hospital, Chromaviso has adapted the light after installation and has given the technical and clinical staff instructions on using the light and information about the significance of the light for the staff’s work and well-being.